It’s that time again! 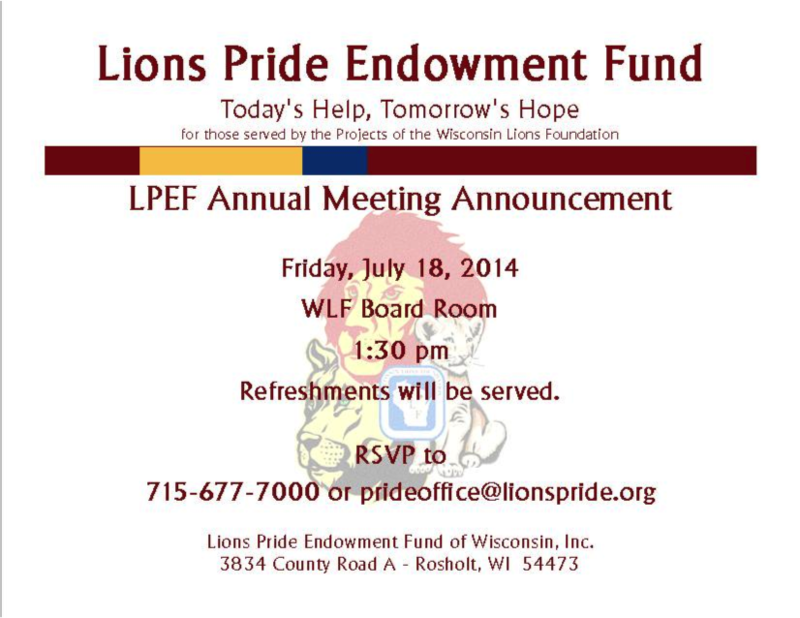 The 3rd Annual Lions Pride Annual Meeting will be held tomorrow, July 18, here at Wisconsin Lions Camp. We will be discussing the 2013 – 2014 year activities, fundraising activities, donations and financial position. We will also hear from our Chairman/CEO Dewey Carl and get the opportunity to thank a few of our donors in person. If you are unable to attend tomorrow’s meeting, the annual report will be available on Monday. You can request an electronic or paper copy by emailing us at prideoffice@lionspride.org. The report will be available to everyone online with our next website update. The annual meeting gives us the chance to look back at the year and celebrate all of our successes. We’ve said it once, we’ve said it again and we’ll keep saying it; thank you to all of our donors and volunteers all around the state of Wisconsin. Our donors are part of “Today’s Help, Tomorrow’s Hope” for Lions Camp and all WLF statewide projects. Not yet a donor? Click here to make a donation today!